This week’s BEACON Researchers at Work blog post is by MSU graduate student Alycia Lackey. The world’s biodiversity represents a balance between the formation and extinction of species. To understand what drives diversity, scientists study what generates, maintains, and degrades species. This work is particularly important in the light of global change and human impacts on the environment. Although we want to know how new species form, it is really hard to study this process because it often takes an extremely long time – millions of years from start to finish! Even when species form relatively quickly, in just a few thousand years, this process is still far longer than a single human’s lifetime (note: there are some exciting exceptions, e.g., microbes). Given the typical timeframe needed for most species to evolve, how can scientists study this process without a time machine? One approach is to look at snapshots of the “speciation process”. You can imagine speciation as a continuum with a single population at one end and two distinct species at the other. 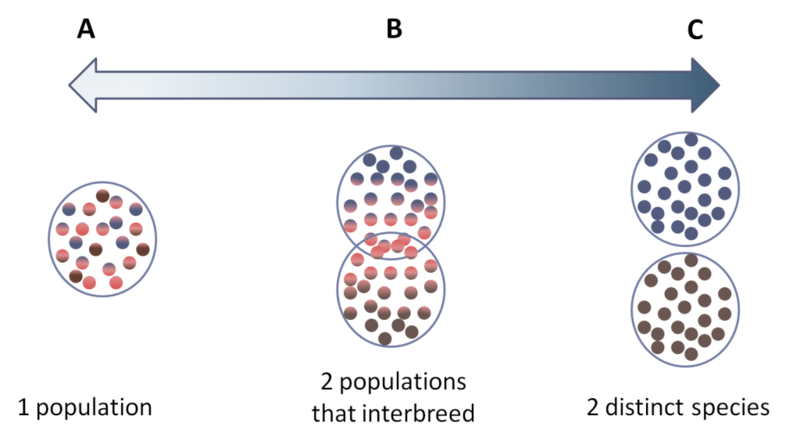 To get snapshots of this process, you can study populations that represent different stages along this continuum. The speciation continuum. Point A represents a single population. Point B represents two populations that interbreed but are somewhat different. Point C represents two distinct species. Scientists might determine that these are distinct species by looking for differences in genes or physical characteristics and by determining whether members of each species mate with each other. 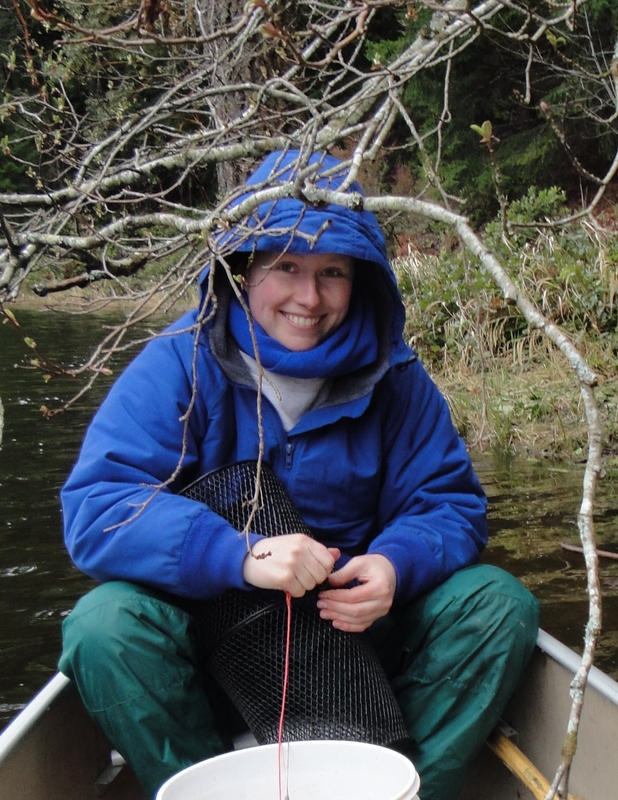 I work with Dr. Jenny Boughman to study the speciation process in threespine stickleback fish, which are small, minnow-sized fish that live in freshwater lakes in British Columbia, Canada. The name “stickleback” comes from the spines along the backs of these fish. There are two species of threespine stickleback fish that have recently separated into distinct species in the past 15,000 years. Two species of threespine stickleback fish: a benthic male (top) and a limnetic male (bottom). Photo credit: J. Boughman. Studying these fish gives us a good idea of what helps populations split into distinct species (Point C on the figure above). For these fish, different feeding and mating habitats have been major players favoring forward progress along the continuum. Stickleback fish are also interesting for studying speciation because human disturbance in one lake likely caused distinct species to become populations that interbreed in just 30 years. (These fish moved from Point C to Point B on the figure above, though this backward movement may not be exactly what happened in the forward direction.) In many cases, human disturbance causes species to go extinct, so this rare case provides exciting insight into how species might break down. Sometime in the 1980s, someone dumped bait with crayfish into Enos Lake. These crayfish are native in British Columbia, but they are very invasive, meaning they can survive and reproduce much better than the animals that already live in that area. After the crayfish were introduced to Enos Lake, there was a major decrease in the number of aquatic plants. Soon after this environmental change, scientists working on the fish in this lake noticed lots of individuals that looked like intermediate forms of the two distinct species. You would expect to find such intermediate fish if members of the two species were interbreeding to make hybrid offspring. Much of my work is focused on asking if this environmental change could have caused changes in fish mating behavior and how that might have happened. Before this environmental change, researchers thought plants were important for how mating occurs in stickleback fish. The two species used different mating habitats: one species mates in open areas and the other species mates in dense plants. So, it’s possible that two mating habitats made mating between members of the two species unlikely. My work has tested how these mating habitats might be important to two aspects of mating in stickleback fish: male competition and female mate choice. Males compete fiercely with each other for territories. Males with territories then build nests and try to attract females with a courtship dance. Females visit multiple males and are very picky about which males they choose. A female deposits her eggs in the nest of the male of her choice, and then the male cares for the offspring. Male-only parental care is actually pretty common in fish, unlike in birds and mammals. This means that males have to put in a lot of energy to pass on their genes to the next generation; they have to compete for territories, court mates, and raise offspring. So far I have found that male competition can help populations to split into two distinct species, but only when both mating habitats are present. In two habitats, male competition favors two types of males. However, when only one habitat is present, like in the case of fish in Enos Lake, male competition favors one type of male. Thus, changes to the environment could have favored fish in Enos Lake to move backward along the speciation continuum from distinct species to populations that interbreed. I also found that female mate choice depends on habitats most when populations are still interbreeding and not so much once species are distinct. Figuring out how the environment affects how species evolve and what happens when they break down gives us great insight into what generates and maintains biodiversity. This is useful for basic biology, so we can understand evolutionary processes that favor new species to form. This work also has very important implications for conservation. It helps us understand what we can do minimize detrimental impacts on environments and help to maintain the biodiversity that exists today. For more information about Alycia’s work, you can contact her at reyno340 at msu dot edu. This entry was posted in BEACON Researchers at Work and tagged BEACON Researchers at Work, Field Biology, mate choice, speciation, sticklebacks. Bookmark the permalink.